It’s that time of year—the middle of winter—when the night chill has you reaching for the nearest blanket to curl up underneath. If your home is feeling particularly drafty, you may be considering a new furnace. But there are a few things that you should know first and you’ve come to just the right spot. Here at Entek, we have over seven decades of experience installing furnaces in the Pacific Northwest. Our HVAC technicians have helped customers improve indoor air quality while also saving on energy costs. So grab some hot cocoa, pull up a chair, and let us share some of what we’ve learned over the years. The first thing you should consider is whether it’s best to replace the furnace with a newer model or try to fix your old one. While our HVAC technicians are skilled in knowing how to troubleshoot just about any problem, it’s sometimes best to consider an upgrade instead of a temporary fix. 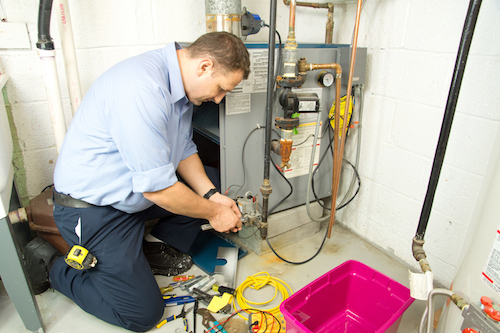 Generally speaking, you should replace a furnace if it’s beyond three-quarters of its lifespan. Most furnaces last between 15 to 20 years. So if yours is over ten years old and is constantly breaking down, it could be a good time to consider an upgrade. If it does appear as though it’s time to replace your furnace, look for an energy-efficient model. Not only are energy efficient furnaces environmentally friendly, they’ll also save you on energy costs as well. The energy efficiency of a furnace is based off its AFUE, annual fuel-utilization-efficiency rating. While some older models have AFUEs as low as 65 percent, newer furnaces can have an AFUE up to 97 percent. That means the unit will operate at near maximum efficiency, giving you more bang for your buck, which translates into cost savings on your energy bill! While a high-efficiency model may cost more money upfront, it could pay off in the long run. Our HVAC specialists at Entek will help you calculate your cost savings based on furnaces with different energy efficiency ratings. This will help you determine which furnace will best meet your needs. In addition to a furnace’s energy efficiency, you’ll also want to consider its size. In this case, bigger is not always better. Choosing the right size furnace based on your home’s specifications will optimize the system’s performance. When an HVAC system is oversized, it could actually increase your upfront costs while also decreasing the system’s overall efficiency, as well as the comfort level of your home. Instead, make sure the contractor you choose sizes your equipment based on ACCA Manual J procedure, which is the industry standard. Once you’ve made the decision to install a new furnace, be sure to do your research and select the right contractor to perform the installation. Did you know, for instance, then an improper installation could greatly reduce your HVAC system’s efficiency? In fact, according to the National Institute of Standards and Technology (NIST), an improperly installed HVAC system could lose up to 30% efficiency. That means your cost savings are going right out the window. As mentioned, installing an oversized system is one of the more common errors. Other reasons a furnace system might be improperly installed include leaky ducts, improper refrigerant charge, and restricted air flow. It’s important then that you make sure you do your research and hire the right contractor. Only an experienced HVAC technician should be installing your system. Once you’ve selected the right contractor, be sure to inquire about your available options. For instance, in addition to high-efficiency furnaces, we also offer heat pumps as an energy-efficient alternative. On average, heat pumps can reduce your electricity use by up to 40%. We also offer ductless heat pumps, which are a great option for newly constructed homes or those without existing ductwork. Installing a ductless heating and cooling system can help you see a savings of 25-50% on your electric heating bill. Our Entek technicians will help you calculate your return on investment so that we can find the best option for you. With our expertise, we’ll help you find right HVAC system to reduce your energy bills, improve your home’s indoor air quality, and fit both your budget and needs. If you are going to replace your home’s HVAC system, then you should have a qualified technician inspect your home’s air duct system as well. A leaky air duct system will negate the cost-savings that come from installing an energy-efficient furnace. In fact, according to that NIST study cited earlier, leaky air ducts were found to be the most significant cause of increased energy use. To be specific, according to the Department of Energy, an average air duct system can lose up to 40% of the heating or cooling energy emitted by a home’s furnace, heat pump, or air conditioner. In addition to costing you money, leaky ducts could also be hazardous to your health. Therefore, before installing a furnace, it’s a good idea to have a technician inspect your home’s duct system. Our technicians are skilled in both duct cleaning and sealing. We’ve helped improve indoor air quality for our customers while also helping them save 20% to 40% on their utility costs. When it comes to your home’s HVAC system, it’s best to consult with a skilled professional. Not only could you potentially be losing thousands of dollars because of improper HVAC installation, an old furnace, or a leaky air duct system, but you could also be compromising your health. While it may be tempting to try to diagnose the problem or perform the repairs yourself, it’s best to hire an experienced technician. Let us do the work for you. We have decades of experience and have used our expertise in the industry to save money for countless homeowners over the years. We’ll make sure your HVAC system isn’t simply working, but that it’s working for you.